“I’m a visual thinker and somebody who really notices details,” said Dr. Temple Grandin at the annual meeting of the Maine Grass Farmers Network in August. “I think totally in pictures,” she added. The packed room at MOFGA’s Common Ground Education Center in Unity had come to hear how this autistic person’s particular way of seeing the world could help them manage their livestock. Grandin designs livestock handling facilities worldwide and is an Associate Professor of Animal Science at Colorado State University. Almost half of North America’s cattle are handled in a system that she designed for meat plants, and her curved chute and race systems are used worldwide. Grandin’s writings on the flight zone and other principles of grazing animal behavior have helped reduce stress in many animals during handling. Her scoring system to assess how cattle and pigs are handled at meat plants is used by many large corporations to improve animal welfare. She also researches cattle temperament, environmental enrichment for pigs, reducing dark cutters and bruises, bull fertility, training procedures and effective stunning methods for cattle and pigs at meat plants. Grandin has been featured in many media outlets; has written over 300 articles; and is the author of Thinking in Pictures, Livestock Handling and Transport and Genetics and the Behavior of Domestic Animals. Her book Animals in Translation was a New York Times bestseller. In a handout entitled “Thinking the Way Animals Do,” Grandin wrote: “People with autism and animals both think by making visual associations. These associations are like snapshots of events and tend to be very specific. For example, a horse might fear bearded men when it sees one in the barn, but bearded men might be tolerated in the riding arena. In this situation the horse may only fear bearded men in the barn because he may have had a bad past experience in the barn with a bearded man. “Animals also tend to make place-specific associations. This means that if a horse has bad prior experiences in a barn with skylights, he may fear all barns with skylights but will be fine in barns with solid roofs. This is why it is so important that an animal’s first association with something new is a good first experience.” If a horse falls the first time he’s entering a trailer, he may subsequently fear all trailers, Grandin continued; but if he falls in a two-horse, side-by-side trailer the 25th time he is loaded, he may only fear side-by-side trailers after that, or he may fear the person associated with that trailer. Fear, noted Grandin, is the main emotion in autism and in prey animals such as horses and cattle, and the main response is to flee. “Things that scare horses and cattle also scare children with autism. Any little thing that looks out of place, such as a piece of paper blowing in the wind, may cause fear. [Windy days are often the worst days to handle animals, she noted.] Objects that make sudden movements are the most fear-provoking,” because predators also make sudden movements. At shows, flags, balloons and bicycles are the “three big scaries,” because they have rapid, silent movement – like predators. If an animal cannot flee, it may fight. A confined horse, for instance, may kick or bite – not out of aggression, but out of fear. “Train them to [flags, balloons and bicycles] before shows,” suggested Grandin – not by shoving them in their faces, but by putting a balloon on the edge of a pasture, for instance, or slowly riding a bicycle around. Livestock have wide-angle vision, and shadows or moving distractions outside of their chutes can easily frighten them. For this reason, solid sides on chutes will keep animals calmer than slatted chutes with shadows or other distractions. Because prey species such as cattle and horses have sensitive ears, loud noises (such as a loudspeaker at a horse show) and high-pitched noises can scare them. Grandin emphasized that “yelling and screaming at cows can be as stressful as an electric prod. The research is very clear. Someone screaming at them raises their heart rate more than a gate slamming. It takes 20 to 30 minutes [for the cows] to calm down again. So don’t get them all excited,” unless you want to take a half-hour break, quipped Grandin. An individual animal’s genetics determines its response to situations, too. High-strung, nervous animals usually are more fearful than calmer ones. Rough training may ruin nervous horses, because they become so fearful that they cannot learn. “Horses who are constantly swishing their tails when there are no flies present and have their heads up are usually fearful horses,” said Grandin. “In the wild, horses put their heads up to look for danger.” Such high-strung animals have the most trouble with novel situations. They may appear calm at home, where they are comfortable, but loudspeakers or balloons at a fair may cause panic. Novelty, such as a piece of paper on the ground, can be interesting and welcome to an animal if the animal is allowed to approach it from a distance and on his own; on the other hand, if a horse is being ridden and comes across a piece of paper in the trail, he may shy away from it. Livestock do not have good depth perception and have to stop and put their heads down to see something on the ground. If you don’t give them the chance to do this, they’ll turn back. A small object, such as a coffee cup on the floor, can distract livestock and stop the direction of their movement. Courtesy www.grandin.com. Also, animals may balk at one-way and back-up gates. Install them two to three body lengths away from the crowd pen, said Grandin, and equip one-way gates with a remote controlled rope so that they can be held open when the single file race is filled. If you can fix small details that are bothering livestock animals, the improvement can be significant. “Treat dairy cows nice and you’ll get more milk and a smaller flight zone,” said Grandin. Otherwise, stresses during handling can reduce animals’ productivity, conception rates, and immune and rumen function. Grandin presented data showing that levels of cortisol (a stress hormone) in beef cattle were cut by two-thirds when the animals experienced quiet handling vs. rough handling and electric prods. Get animals used to some change, Grandin advised. Feed them from a different truck, or have a different person feed them sometimes. Train them to people riding on horses and people on foot. Grandin noted that the increased use of round bales of hay gives animals less contact with people, so they may become more scared of people. Cattle, pigs and sheep are herd animals and do best when raised with other animals. Raised alone, they can become stressed, have lower productivity, and be more agitated when handled. The flight zone is the area in which a threat (such as a person) will prompt animals to move away. Courtesy www.grandin.com. Grandin talked about animals’ “flight zone” or “personal space.” When a person is in the flight zone, the animal turns and moves away. Cows raised on extensive ranges may have large flight zones (up to 164 feet), while those raised in feedlots may have flight zones as small as a 6-foot radius. Animals that get frequent, gentle handling have smaller flight zones, while extremely tame livestock have no flight zone — and thus are difficult to drive and must be led with a feed bucket or halter. 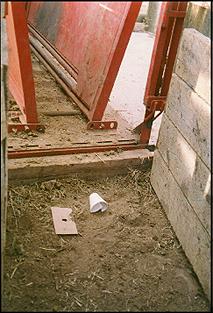 Grandin recommended curved chutes in handling facilities, because they prevent animals from seeing what is at the end of the chute until they are almost there; and because the curve takes advantage of the natural tendency of animals to circle a handler moving along the inner radius. Grandin was emphatic about the importance of good care of organic livestock. “If I find grubs on organic cattle, I’ll throw a fit. Also, I don’t want to see untreated lice … Really skinny cows … are not ok,” either. She also said that farmers have a right to see what’s going on in slaughter facilities and can download a form from her Web site that helps rank the facility. “We don’t want to get into the embarrassing situation where big corporations are doing a better job than organic,” she noted. Currently, “some small plants may be behind big, bad corporate” ones. Grandin’s Web site, www.grandin.com/, has much more information about livestock behavior and methods for working gently with livestock in order to reduce stress and improve productivity, health and handler safety. Her books provide fascinating reading about animal behavior, Grandin’s experiences with autism, and links between the two.